This cake was for Crystal's 40th Birthday! 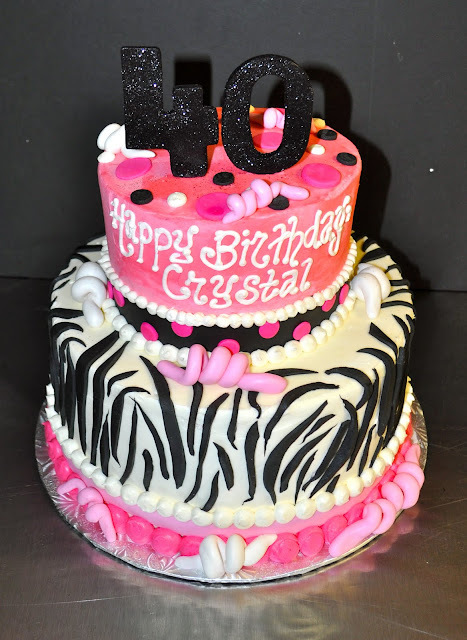 It was based off another design that the client had requested- I added the dots, squiggles, and glitter "40" on top. I also did the zebra stripes smaller/thinner than I normally do, per the original cake, and I think it turned out really cute! 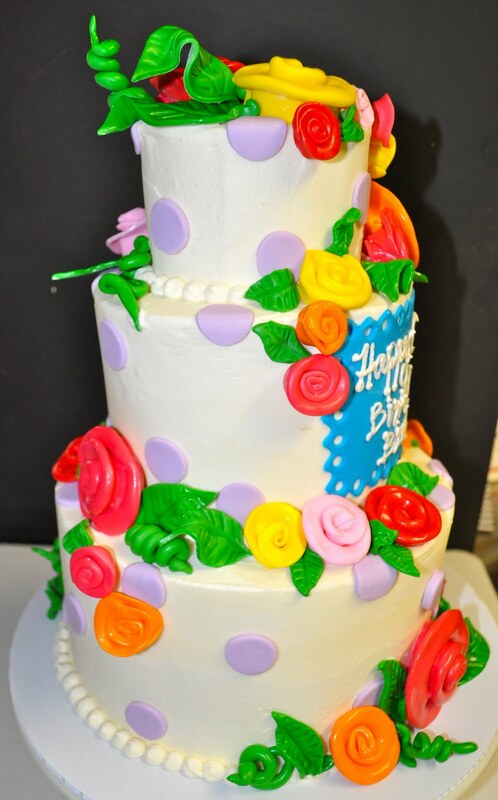 The cake is a 6" and 9" white with buttercream filling and frosting. This 6" white cake with fresh strawberries and buttercream filling was a request to have the same look as the "Pink Damask Baby Shower Cake" but with these super cute colors! I love how they came together on this cake. 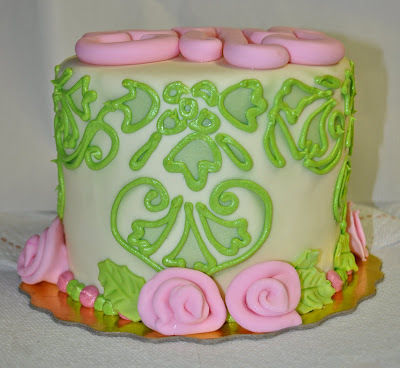 It is covered in a pale yellow fondant, airbrushed with a light green and then piped with a matching green buttercream. The border has light pink fondant ribbon roses and a matching light pink "Eily" on top. Here is 2 out of the 5 dozen cupcakes for Livia's 4th birthday party with a "Tangled" theme. (Rapunzel) The cupcakes are white, confetti (with sprinkles to match!) and chocolate with colored buttercream to also match the plates and cups. 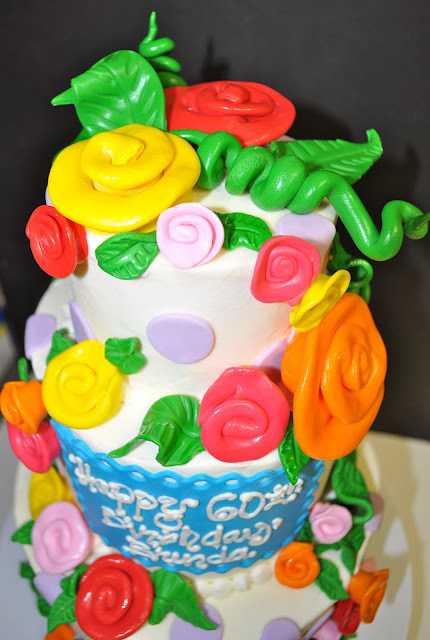 The little fondant braids, crowns, 4's, flowers etc are all made from fondant. 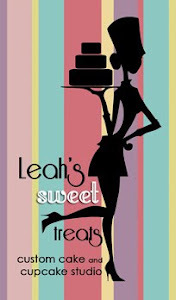 "Hi Leah! Just wanted to thank you again for the cupcakes you made for Livia's birthday. They were absolutely adorable and delicious! We received so many compliments on them (and gave your name to several people)! Hope you had a great weekend! Thanks again, and good luck getting your store going. The cake was 6" 9" and 12". Top tier- yellow cake with chocolate buttercream filling, buttercream frosting and covered in red fondant with stars imprinted all around. The middle layer was a chocolate chip cake (white cake with mini, semisweet, and dark chocolate chips baked in) with buttercream and fresh strawberry filling. And the bottom layer was a chocolate cake (4 layers!) with 2 layers of chocolate buttercream filling and one layer of buttercream. 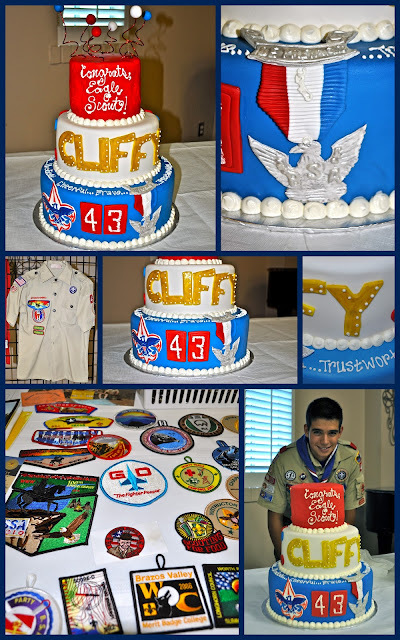 The badge, logo, and all other details are made of fondant. 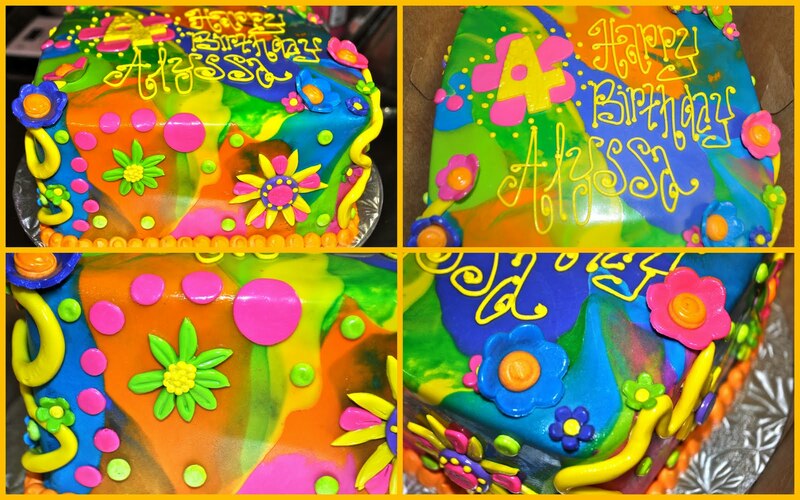 I am calling this the psychedelic cake, because well, I'm not sure what else to call it! It is based off a cake that can be found on the gallery of my website. I have to admit, the original cake I made a very long time ago when I was first getting started- so I wanted to do an "upgraded" version of the original cake. 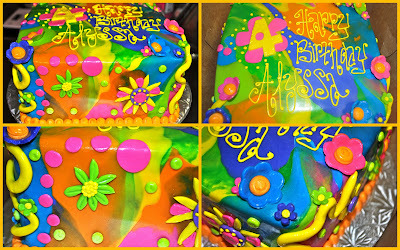 The fondant is a "tie dye" technique over an 8" square chocolate cake with buttercream filling. The rest of the details- flowers, swirls, dots etc are also made from fondant. Click on Image to Enlarge!! 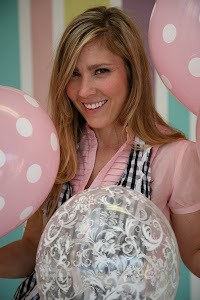 These cupcakes were based off the design of the invite (can be seen below in collage photo) for Samantha's baby shower! I absolutely loved the invite- so funky & fun!! The cupcakes were a mixture of 2 dozen standard sized and 2 dozen mini cupcakes- vanilla bean, double chocolate, confetti, and red velvet. 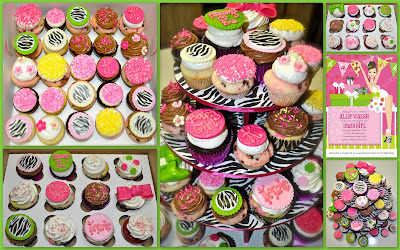 The fondant toppers and sprinkles were made to match the invite- lots of zebra stripes, bows, polka dots, and flowers. Click on Image to see Larger View!! Another super fun project that I enjoyed so much!! Addilyn's first birthday party is "Ice Cream Shoppe" themed, and her sweet Mom Jessica provided me with the color scheme of the plates and decor being used. 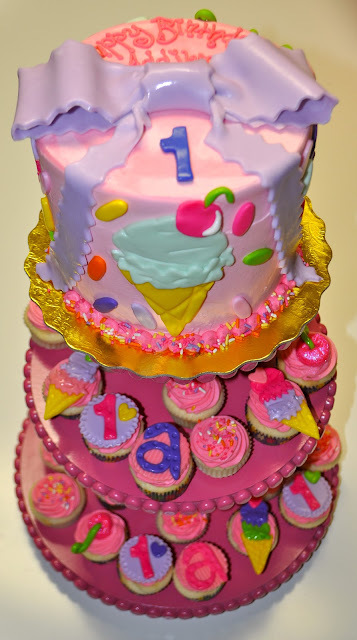 The smash cake is a 6" white cake with buttercream filling, pink buttercream frosting and lots of fun fondant details: ice cream cones, sprinkles, and purple bow. The cupcakes are 2 dozen mini vanilla bean cupcakes with pink buttercream frosting and matching fondant double scoops, pink cherries with pink disco dust glitter, "a's" for Addison, and "1's". ...It's that time of year again. Yes little ones, you know what time I'm talking about-- back to school time!! Smiley face? Sad face? Scared face? ...Cupcake face!! Here are 4 dozen mini cupcakes for Trinity Valley Teacher Appreciation day. They are a mixture of white and double chocolate with regular and chocolate buttercream with fondant details and matching sprinkles!! I totally love this cake! 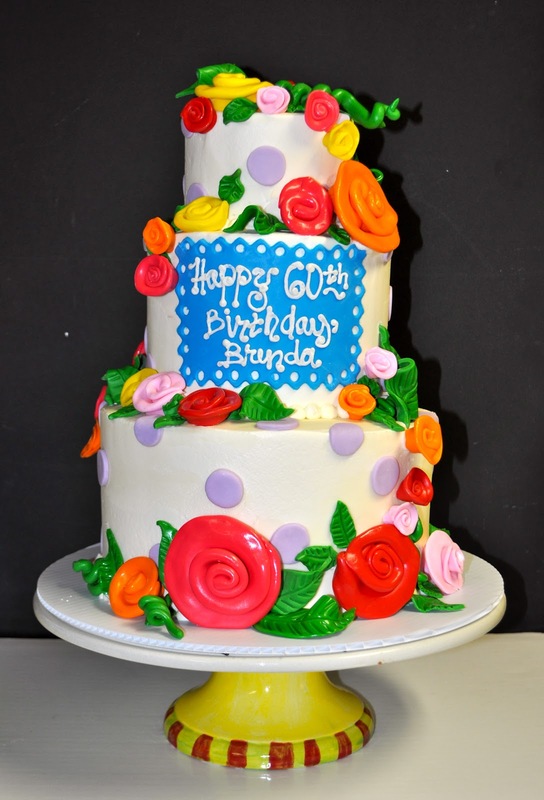 It is for a surprise birthday party at Mira Vista for Brenda's 60th Birthday! The client simply asked for a chocolate cake with roses on it, and said I could take it from there..... so this is where I went with it! :) Buyers beware::: if you tell me I can use any colors-- I will probably use them all!! Instead of doing petal by petal fondant flowers I thought it would be cool and unique to do whimsical "ribbon" roses, and I think it turned out awesome! 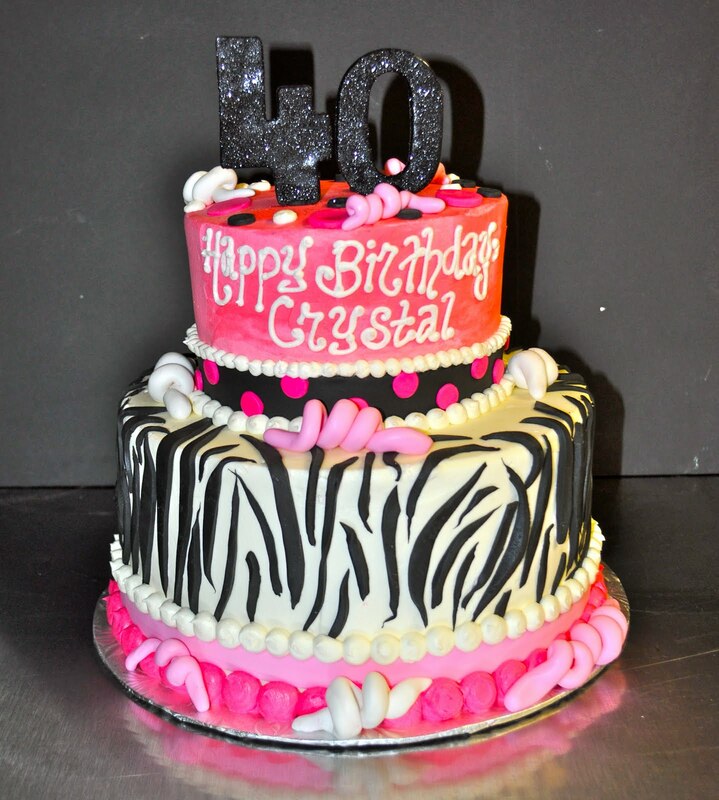 It is a 3 tiered chocolate cake 4, 6, 8" with buttercream filling and frosting. 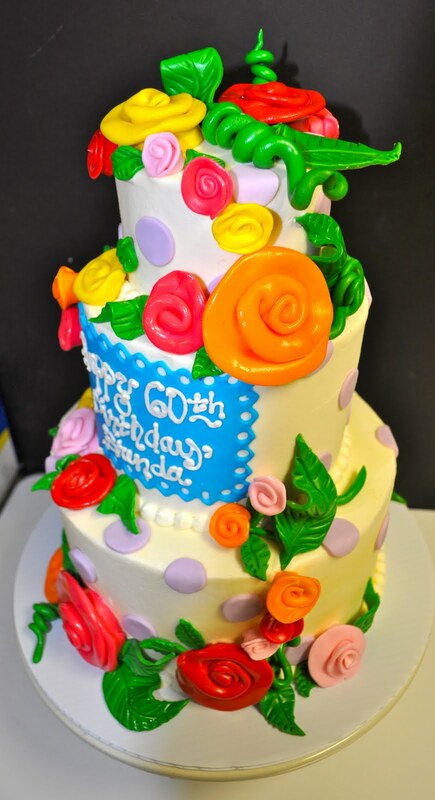 The flowers/leaves/vines/polka dots are all made from fondant. This is a Rangers/Baseball birthday cake for little Weston! The cake is a white cake with buttercream filling, and green buttercream frosting in the shape of a baseball diamond. All the little baseball and "4" details are made from fondant. Here we have 2 dozen mini cupcakes for a graduation celebration from the TCU Nursing School! I was so excited when the client requested purple colored cupcakes! 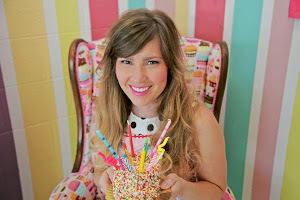 I love the idea of tinting cake, and also doing "confetti" cake with sprinkles to match your theme! They are white cupcakes- dyed purple, with purple and white sprinkles baked in for an extra surprise, buttercream frosting, and purple and white sprinkles! The diplomas, nurse hats, and "TCU's" are all made from fondant. Once again I was running late when I took these pictures, so I apologize for more box pictures!! These were one dozen cupcakes for Robyn's boyfriend Joe on his 25th birthday! 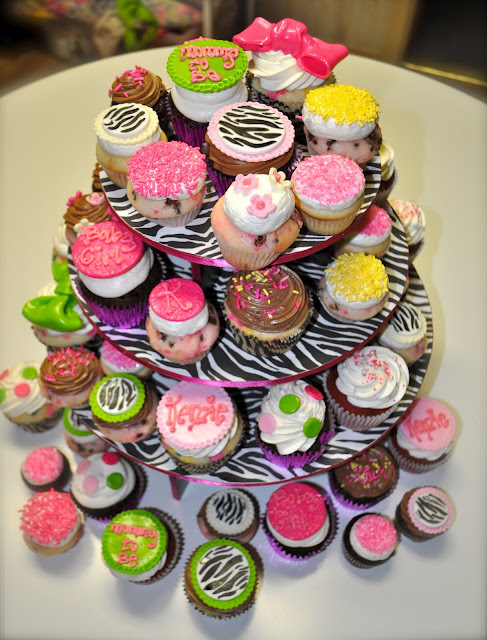 They are both poker fanatics, and she wanted to surprise him at work with these fun cupcakes. They are half chocolate and half white with buttercream frosting and fondant poker themed details. 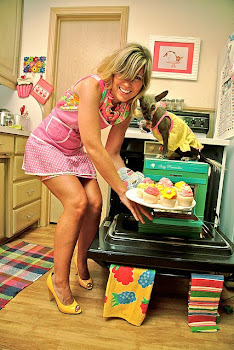 "Smash Cakes" are all the rage for your babies first birthday! 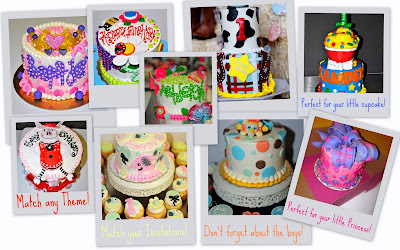 They are small 6" cakes for your little one to "smash" on his or her special first birthday! 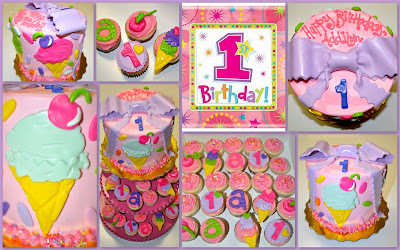 They are the perfect way to make your little one's first birthday celebration extra special. They can be designed to match any theme, any color, any celebration! Many people like to order matching cupcakes so the other kiddo's and adults can enjoy sweet treats, and they look super cute next to your smash cake! Email Leah today to find out more about a smash cake for your little one! Prices usually run anywhere from $40-$60 depending on intricacy of theme/design. 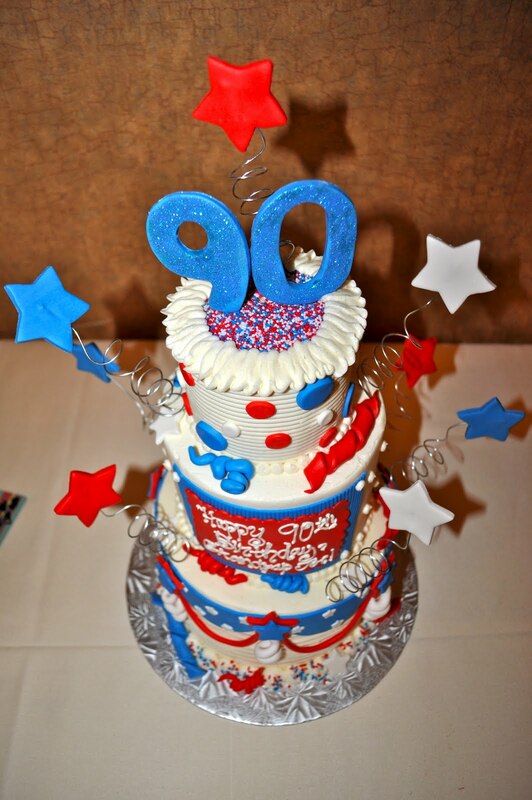 This red, white and blue "patriotic" birthday cake was for "Grandpap Joe's" 90th Birthday Celebration at Mira Vista this weekend. 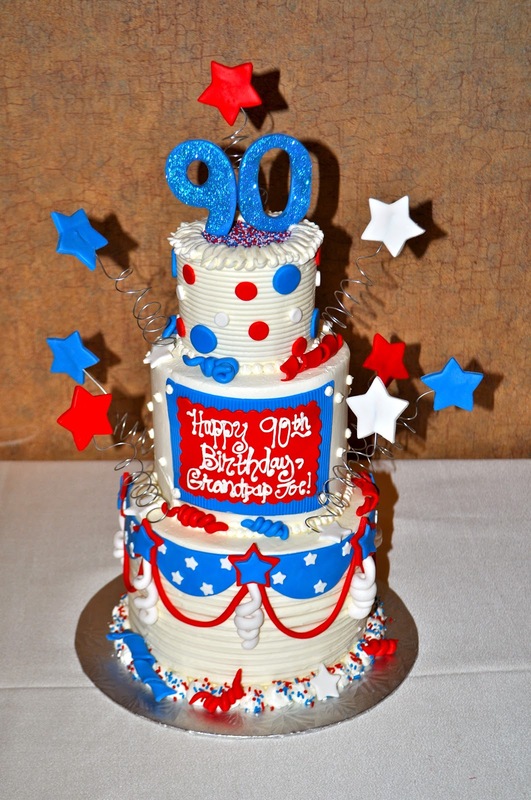 The cake was a 4", 6", 8"- all spice cake with buttercream filling and layers of fresh strawberries and blueberry fillings to keep up with the red white and blue theme! 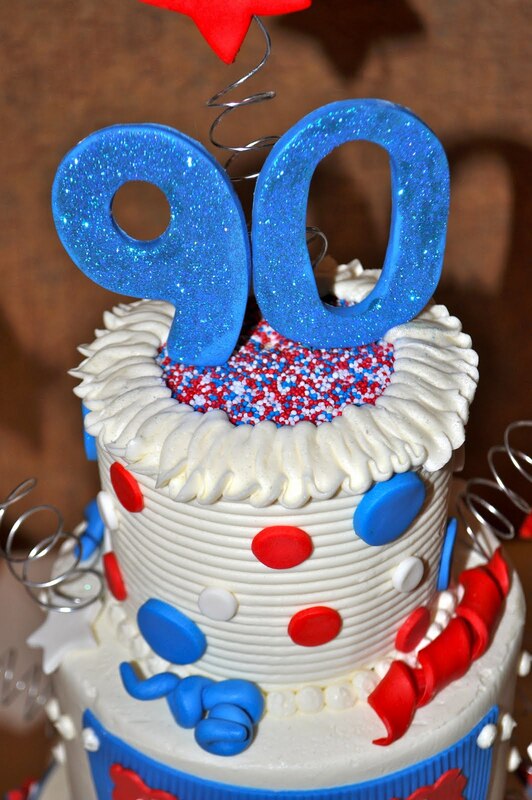 All of the little fun details, stars, and "90" are made from fondant- and yes they are all edible, and that is edible glitter on the 90 aka "disco dust"! I love how this cake turned out, and hoping Grandpap Joe got a kick out of it too! !